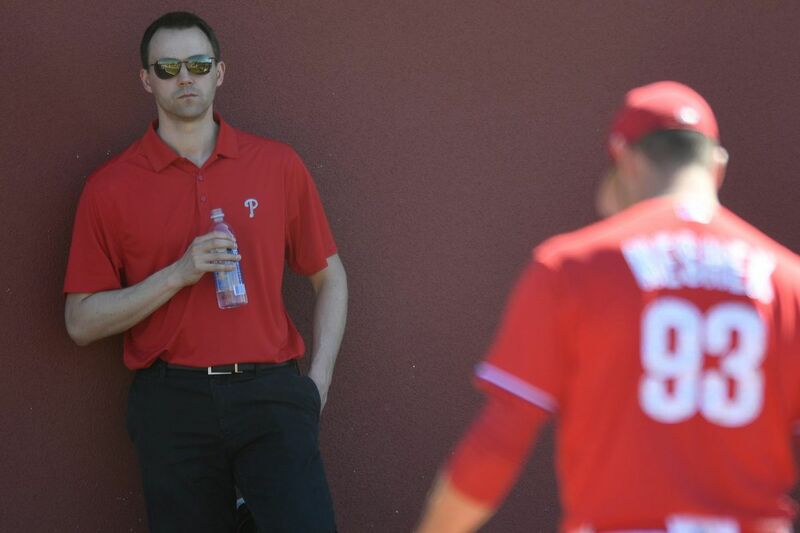 Phillies GM Matt Klentak looks on during spring training workouts at Spectrum Field, in Clearwater Florida. Sunday, Feb. 18, 2018. The worst case scenario was always the one where things broke right in every area except the one the Phillies failed to address. And, hey, maybe that scenario is still in play. Even with Jake Arrieta and Aaron Nola in the fold, the Phillies rotation still has more questions than answers. There's still a conceivable world in which the lineup reaches its potential but can't out slug the deficit it faces three out of every five nights, a world where we look back in September and wonder what the standings might look like with a little more pitching. But such is life at this stage of a rebuild. The important thing for the Phillies is that, in adding Arrieta to the mix on a three-year, $75 million deal on Sunday afternoon, they controlled what can be controlled. They saw a weakness on their roster with deal-breaking potential and they went out and addressed it. In doing so, they made the message that Gabe Kapler has been preaching to his players all spring feel a little more real. Is it probable that the Phillies are playing meaningful September baseball? Maybe not. But for the first time in at least three seasons, such a world is conceivable. For some idea of what the addition means, let's limit our initial scope to last season, when Arrieta's production was a shadow of what it had been in the two years prior. In 2015-16, the righthander averaged 32 starts and 213 innings with a 2.39 ERA and averages of 9.0 strikeouts, 2.6 walks and 0.5 home runs per nine innings. An advanced metric called ERA+ pegged him at 67 percent better than league average during that stretch, which included the 2015 NL Cy Young Award. In 2017, he logged just 168 1/3 innings over 30 starts with a 3.53 ERA and averages of 8.7 strikeouts, 2.9 walks and 1.2 home runs per nine innings. ERA+ said he was 23 percent better than league average. Now, consider Nola's numbers last season in his breakout campaign: 27 starts, 168 innings, 3.54 ERA, 9.9 K/9, 2.6 BB/9, 1.0 HR/9, with an ERA+ that was 19 percent above league average. In essence, the Phillies will have added another Nola even if Arrieta's 2017 is his new normal. Yet the true magnitude of this move lies in the production Arrieta will be displacing. Before his arrival, the Phillies faced the prospect of heading into a season with three pitchers in their rotation who had never eclipsed 135 innings in a major-league season, and a fourth in Jerad Eickhoff who managed just 128 innings with a 4.71 ERA in an injury-shortened 2017. Even with Nola's excellent 2017 performance factored in, the Phillies entered spring training with a rotation whose projected members combined to post a 4.66 ERA the previous season. There were only two rotations in the National League that set up in worse shape. That would have been a dangerous game to play for a team with a lineup with as much potential as theirs. Last season, the Phillies won 57 percent of their games in which a starter went at least six innings and allowed three or fewer runs. The problem was that, in the 137 games not started by Nola, they had a starter achieve that feat just 36 percent of the time. Arrieta, by contrast, logged 6+ innings with three or fewer runs in 55 percent of his starts last season. That's a difference of more than six starts in a 32-start season. For the Phillies, this was as close to a no-brainer as $25 million per season gets. There are risks, no doubt. Most notable is the dip in velocity Arrieta saw on his fastball last season, when his four-seamer fell from an average of 94.3 MPH in 2016 to 92.6 MPH in 2017. His two-seamer featured a similar decline. There was regression in his results, too. Arrieta struck out significantly fewer batters, allowed significantly more extra base hits, and significantly fewer groundballs (see table below). At the end of June, Arrieta had a 4.67 ERA and was averaging just five-and-a-half innings per start. His results were much better over the final three months of the season, with a 2.26 ERA in 79 2/3 innings over his last 14 starts, but the rate stats remained largely unchanged. Yet even if Arrieta's aging curve is as steep as those the Phillies witnessed with Roy Halladay and Roy Oswalt, his contract will be off the books before it has a chance to significantly limit their ability to accommodate future contracts. They now have $67 million in salary commitments for 2019 and $58 million for 2020, leaving them more than $110 million beneath the luxury tax threshold in each season. As for 2018, the thought that they might compete in a wide open NL East requires a heavy amount of hope and projection. Still, to enter the year without any meaningful addition would have felt like a white flag. While track records do not guarantee future performance, they are all anybody has to go on in situations like this. The Phillies have effectively replaced an uncertain one with the best one available.